Minister for Transport Shane Ross has said a decision will be taken early next year on whether to build a third terminal at Dublin Airport. Speaking on RTÉ's News at One, Mr Ross said consultation is beginning immediately with stakeholders, such as Transport Infrastructure Ireland, DAA, Fingal County Council and members of the public. He said the earliest the terminal will be built, if a decision is taken to go ahead with it, will be 2030/2031. He added that a report published today has predicted "an explosion of passengers through Dublin airport by 2050, to over 50 or 60 million people." Minister Ross said a "dramatic expansion of the airport would be needed to accommodate them." He said at this point he "has no idea of the logical place for the terminal" but added that "today's report suggests at least three alternatives to the North East, North West and West" of Dublin airport. The report looked in detail at what is needed to cater for increased passenger numbers. The study found that an independently owned third terminal would be both feasible and maximise the choice for airlines. Other alternatives include the DAA expanding the current terminals and building a satellite one. The report also identifies the need for smaller scale expansion at Cork and Shannon. A study of the roads and motorways leading to Dublin Airport will also get under way immediately to find a location for the new terminal that would be best served by the road network. In a statement, the DAA said it has not seen the report "which has been selectively leaked to the media" but its "consistent position over the past two years has been that Dublin Airport does not need a new terminal at the moment". 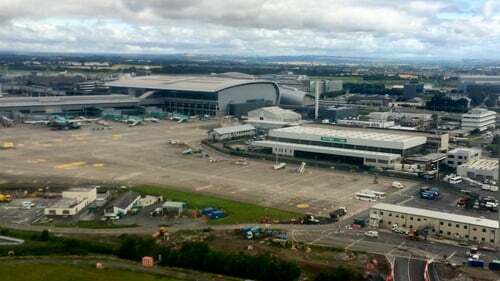 "To cope with the success that Dublin Airport has had in attracting new business in recent years Dublin Airport needs a new runway, aircraft parking stands, boarding gates and other facilities. It also urgently needs new legislation in relation to the management of aircraft-related noise." The statement added: "We are about to begin consultation on a major investment programme that will include more than €900m worth of capacity investment to build the required infrastructure at the airport. "This report also seems to fly in the face of the State's National Aviation Policy, which was only adopted three years ago." This was supported by Aer Lingus which said talk of a third terminal could distract from these projects and inhibit the delivery of passenger growth. Ryanair also said in a statement that runway capacity not terminal capacity is the issue. Fianna Fáil's transport spokesperson Robert Troy described plans for a third terminal as "premature". Speaking on RTÉ's Morning Ireland, he said Dublin Airport needs a second runway and additional piers in order to grow. He said Minister Ross' handling of the second runway issue has been hugely disappointing and inadequate. It was more important, he said, to put an independent noise regulator in place in order to help the DAA appeal two restrictive planning conditions hindering the construction of the second runway. Ulick McEvaddy of Omega Air said a third terminal is essential for the expansion of Dublin Airport. Speaking on RTÉ's Today with Sean O'Rourke, he said he has been "planning for this" for over two decades. Mr McEvaddy said that that the airside space is too congested and the airport needs to expand the apron westwards, where he owns much of the land. He said a new terminal should be in place in the next five years and should cost €1.5bn and could all be funded by private investment. Mr McEvaddy is part of an international consortium has been in talks with planning authorities about a third terminal at Dublin airport. Tri-Aviation is a partnership between brothers Des and Ulick McEvaddy and a Dubai-based investment company, Tricap. The McEvaddy brothers own 128 acres beside Dublin Airport that is zoned for a third terminal. It is believed they are seeking to apply to An Bord Pleanàla for fast track planning for the project as strategic infrastructure. When the board granted permission for Terminal 2 it said a third terminal should be in planning by the time passenger numbers at the airport reach 32 million because of the traffic this would generate. Numbers could reach 31 million this year but Dublin Airport is expected to apply for this condition to be varied arguing that there has been a big shift to public transport. CEO of Limerick Chamber Dee Ryan has said that further development of a third terminal at Dublin Airport will undermine regional development under the National Planning Framework - Project Ireland 2040. "Airports are recognised as catalysts for growth. If a region's airport is strong, the regional economy will be strong," said Ms Ryan. "A key factor in Dublin's rapid economic growth is the growth of its airport. However, if one of the key goals of Ireland 2040 is achieving greater economic balance across regions, then further expansion at Dublin Airport without a parallel investment in Cork and Shannon is unquestionably going to undermine this. Worse still, this is not alone going unchecked but today's reports suggest it is about to be sponsored further by Minister of Transport Shane Ross. The Limerick Chamber CEO said that it is hard to see how Shannon, Cork, Knock and other airports will be able to compete, and this will have a knock-on effect on economic growth.